Does anyone have exact location information on where the Yuma scenes were filmed? I'm going down there next month and would like to find them. I've not been there myself, but if wikimapia is to be believed, the filming location is immediately south of the Sand Hills rest stop on Kumeyaay Highway a few miles west of Yuma. I've been talking to Gary on the side also and wanted to share some of the info here too. I have the same spot as the wikimapia link marked on the world map on our site. Looking at Google maps it looks about a half of a mile in from the road. There is a freeway exit there for Gary Wells road so it is easy to find. I didn't walk in when I went since I didn't have any info to go by at the time so I just took pictures from the road. I have heard of people walking in though. It's probably best to have a 4-wheel drive to get a ride out there if you can get one. The San Diego Star Wars Society goes out there every once in awhile. Here are the details and pics from last years trip they did (click "see more" to read all of the details). You could also try posting in the San Diego Star Wars Society message board, there might be someone that lives nearby that would be willing to go along with you or provide some more exact directions to help out. Corky Cobon who lived in Yuma, AZ posted an article on this site and offered to help out for anyone interested in visiting the area if you wanted to try contacting him. There was an interesting article about a trip out there with Jad Bean in Harpers magazine. There are some nice shots here too that give you some perspective of what the set looked like during filming. In the article there they talk about walking in over the dunes. This article is also published on the Prop Store website along with some other cool locations and behind the scenes articles. The second page of that therpf.com post has Brandon Alinger talking about his visit, he mentions using a metal detector to find the fence posts that were around the set. Here is a cool documentary of some fans checking out the filming there. It shows a little of the area and the fence that was there. This is a good shot of the set on that website. I went out there in May 2010. I remember it was really quiet, we were the only ones in the car park and we only saw one person out riding the dunes on a motorbike. Later a couple of border patrol quad bikes stopped by to ask what we were doing, they were OK with us when we explained we were looking at the Sail Barge filming location and hoping to find a few pieces of plywood and foam (which we did). We even found a few metal poles sticking out of the ground by an inch or two, it seems rather than remove them some were just sawn off at the base. Perhaps they were sunk into some concrete foundations, who knows? I'm told it gets busy in the Summer and you shouldn't really walk out there in the dunes because of the riders and drivers, but like I said, we were the only ones in the car park and it was only about half a mile / 1km from the car park to the location. As we walked we saw traces of an old broken tarmac road (under the shifting dunes) leading out to the valley which makes sense as in the old videos you can see the road and the equipment trucks that must have used it. It was at Buttercup Valley in the Imperial Dunes, and the location is in California, whilst the cast stayed in nearby Yuma, Arizona. The wikimapia entry is totally correct. How hot was it when you were there? I'm considering walking out there. How long did it take in sand dunes to walk a half mile?? Did you have the GPS coordinates because some people I've talked to have said it takes hours to find out unless you have a metal detector. How did you end up finding it? Hi That is great, That is awesome information, i was also looking for this.How can i get this>? Welcome to the site. I don't understand exactly what you're asking for in your question. Can you be more specific? Take a look at the SW Locations World Map http://www.starwarslocations.com/staticpages/index.php?page=worldmap and have a look around Yuma, AZ. 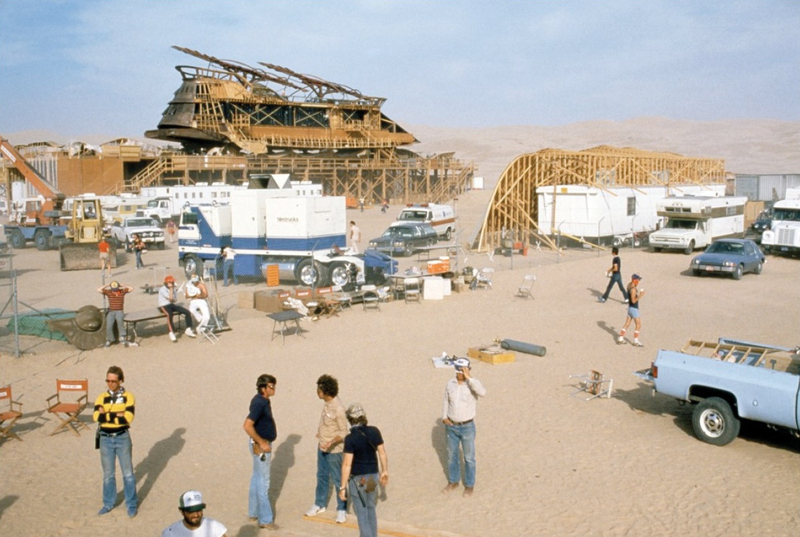 It shows you the car park and the film location in the dunes. Its a short easy walk maybe 30 mins. Temperature wise it was moderately hot, worth taking a hat some sun screen and some drinking water, but not unbearable. For research watch the "Making Of" documentary that came out with ROTJ as it includes a helicopter fly-over of the sail barge set which should put everything into place when you compare it to the World Map. All times are PDT. The time is now 11:48AM.